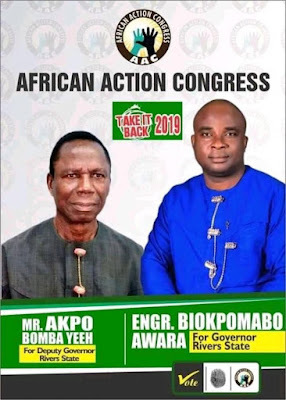 The governorship candidate of the African Action Congress in Rivers State, Biokpomabo Awara, has dismissed claims by his erstwhile running mate, Akpo Yeeh, that the Minister of Transportation, Rotimi Amaechi, made them to sign undated letters of resignation. The deputy didn't say both of them, but just him so there will be a deputy by Amaechi. Awara also expressed disappointment over Yeeh’s defection to the Peoples’ Democratic Party. He stated this in Port Harcourt on Tuesday, adding that Yeeh’s allegations against the minister were false. He said Amaechi and the All Progressives Congress offered the AAC unconditional support. Awara said he was offered N3bn to drop his ambition, adding that his erstwhile running mate was aware that he (Awara) rejected the offer. 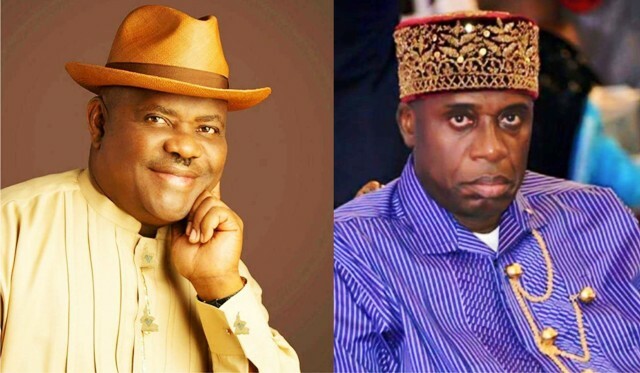 “When the news first came out that Rivers State governor has offered him N200m to abandon me, I had no reason to believe it because that Elder Yeeh was aware I had earlier turned down an offer of N3bn that Governor Nyesom Wike offered me some days ago through his associates. “I made several attempts to reach my deputy without success; then I started developing some strange feelings pointing to a possible sellout by him. “I want to state that all the accusations made by my running mate against Mr Rotimi Amaechi are blatant lies poorly crafted by his paymaster, Governor Wike; and you could see how tough it was for him to read the script handed to him. “I was never asked to and did not sign any letter of resignation. I am aware that my deputy also was not asked to or signed any letter of resignation. The support the AAC got from the minister and the APC was unconditional,” he said. But is it possible for any politician to mobilize for someone to become governor without conditions? However, the Rivers State PDP Campaign Council said Awara, had mastered the art of telling lies since the APC adopted his party. The council’s Director of Information and Communications, Emma Okah, denied that the governor offered Awara N3bn or any sum to drop his ambition. “Where will the governor get such money to give anybody as bribe to win an election that he has already won? Awara is running faster than his masters in learning the art of falsehood,” he said.